The correct answer was “Who is Robin Cook?” However, there is a connection. 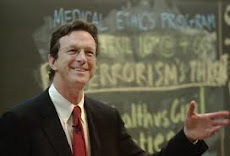 Michael Crichton wrote and directed the 1978 film adaptation of Coma. “What is The Andromeda Strain? The doctor was in, or rather on, the list with his environmentally themed "State of Fear"
This thriller by Michael Crichton is a follow-up to "Jurassic Park"
An airplane quality assurance officer is the heroine of "Airframe" by this author of "Jurassic Park"
One reviewer said "Wondrous beasts and scientific possibilities" made this Michael Crichton novel "alluring"
Under a joint pen name, this "Congo" author co-wrote "Dealing: Or the Berkeley-to-Boston 40-Brick Lost-Bag Blues"
This novelist & medical school graduate (Harvard '69) created the TV show "ER"
1997 International Tournament semifinal game 2. "The Andromeda Strain", "Jurassic Park"
Between his novels "Congo" & "Sphere", he published "Electronic Life: How to Think About Computers"
This author of "Acceptable Risk" has been dubbed "The Master of the Medical Thriller"
I just remembered something! Michael Crichton was born in Chicago and that’s where I’m going for the Jeopardy tryouts. Another sign!